Texas has received substantial attention this election cycle, with candidate visits that included speeches in Austin, Dallas and San Antonio. However, the personal attention from national candidates within the state has not extended into the East Texas region (with the exception of Donald Trump Jr.'s September fundraiser in Longview). To many who follow political trends, this is expected because in past elections the counties in East Texas have voted in support of the Republican nominee for president. However, a recent poll sponsored by the Center for Social Science Research at the University of Texas at Tyler revealed unexpected trends in political attitudes of the East Texas region, especially which candidate voters are going to support. Following the pattern of changing demographics across the state, some polls have suggested that Texas is moving closer to becoming a battleground. A strong force in this projection is the almost 37 point advantage Democratic nominee Hillary Clinton has over Republican nominee Donald Trump in urban areas such as Austin, Dallas and Houston. Texas' support for Trump increases as you begin to leave the urban centers of the state — support for Clinton declines to 25 percent in rural areas. New results from the East Texas Poll provides an opportunity to understand public opinion in the Piney Woods region, despite the wide variation in public approval for the candidates across the state. From Athens to Ore City, the opinions of voters in this election have shown interesting trends. The level of support Republican candidates in this election are receiving from this region is greater than what other polls have shown across the state and nation. In the presidential race, individuals in eight East Texas counties prefer Trump over Clinton by a 45.4 percent margin — 61.4 percent to 16 percent. Trump's greatest support can be found in Henderson County (75 percent), Van Zandt County (75 percent) and Rusk County (70.8 percent). Across all eight counties, Trump has an advantage, with the weakest levels of support coming from Gregg County (46.7 percent for Trump and 26.1 percent for Clinton). However, Trump's support across East Texas lags 12 percent on average behind the support for Republican nominee Mitt Romney in 2012. 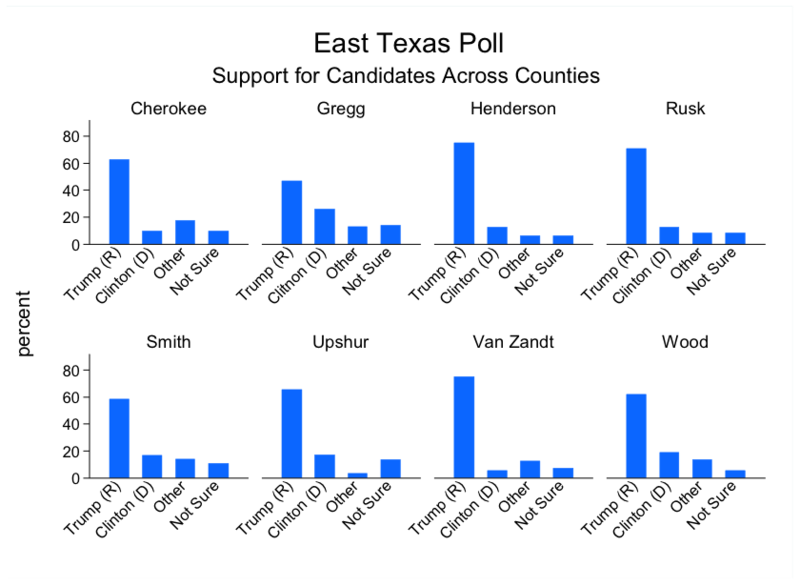 Another meaningful comparison is how public opinion for the presidential candidates varies across the demographics of the East Texas community. It is clear that white voters in the eight-county region support Trump (78.5 percent). The surprising aspect of the poll is the degree to which respondents did not support Clinton (10.5 percent), while 8 percent of voters are not sure whom to support. Clinton derives her greatest support in the region from black voters (46.3 percent), but this is well below the average opinion of black voters nationally and across the state (93.3 percent, according to the UT/TT poll). Another aspect of public opinion in the region that challenges the national narrative for this election is that Hispanic voters in the community support Trump (45.5 percent) at rates higher than the state (32.8 percent, according to the UT/TT poll). With this comparison, it is important to point out that one-fifth of the Hispanic respondents in the poll have not indicated support for a major-party candidate before the election. These numbers are meaningful in the context of the election across the entire state of Texas. Within the past four elections, there has been an expectation that voter turnout will favor the Republican Party in East Texas, but individuals that reside in these counties are reacting to the national campaign. Although voters in the first congressional district of Texas appear to support Trump (58 percent) and incumbent U.S. Rep. Louie Gohmert (57 percent) at similar levels, there is reason to believe that individuals will vote split tickets. Estimates show that 14.6 percent of individuals who support Gohmert or his Democratic challenger, Shirley McKellar, do not intend to cast their ballot for the same party's presidential nominee. Following these patterns, the success of each candidate within the region also hinges on how independents in East Texas will cast their vote. As the campaign closes, 21.6 percent of independents remain undecided on which candidate they will support. Of those independent voters who have a preferred choice among the candidates, 29 percent are not supporting either major candidate, 36.6 percent are supporting Trump, and 12.7 percent indicated that they would support Clinton. In the closing days of the campaign, individuals are continuing to collect information to make their final decision. 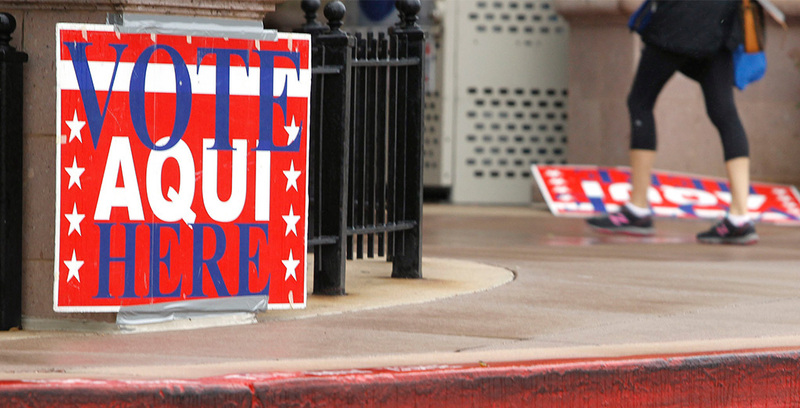 As for turnout, 58,357 votes were cast in Smith County during 12 days of early voting. Still, approximately 56.8 percent of registered voters in the areas around Tyler are either choosing to make their decision on Election Day or will not be participating. Such a trend points to the expected high turnout in the region — especially when compared to the 50,567 early votes cast in 2012, when the final turnout was 68 percent of registered voters in Smith County. The East Texas Poll is a survey of 469 residents across Cherokee, Gregg, Henderson, Rusk, Smith, Upshur, Van Zandt, and Wood counties. The poll was conducted from Oct. 1-14 and has a margin of error of +/-4.5 percentage points. The survey is sponsored by the Center for Social Science Research at the University of Texas at Tyler in the fall of each election year.